We are pleased to present a brand new series of concerts: Solem lates. 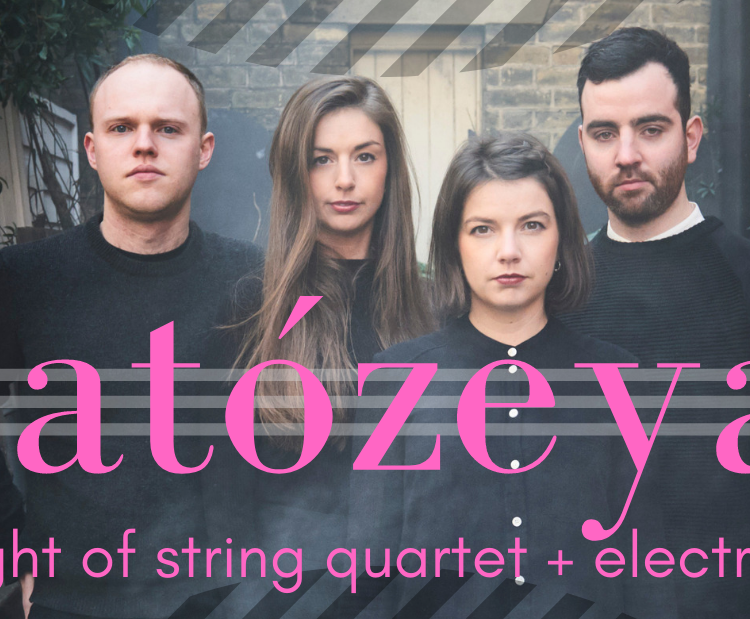 With these concerts, we aim to bring string quartet music to non-traditional venues and to engage a new generation in classical music. There will be an emphasis on contemporary music, and on collaborating with musicians and artists from a different background to our own. 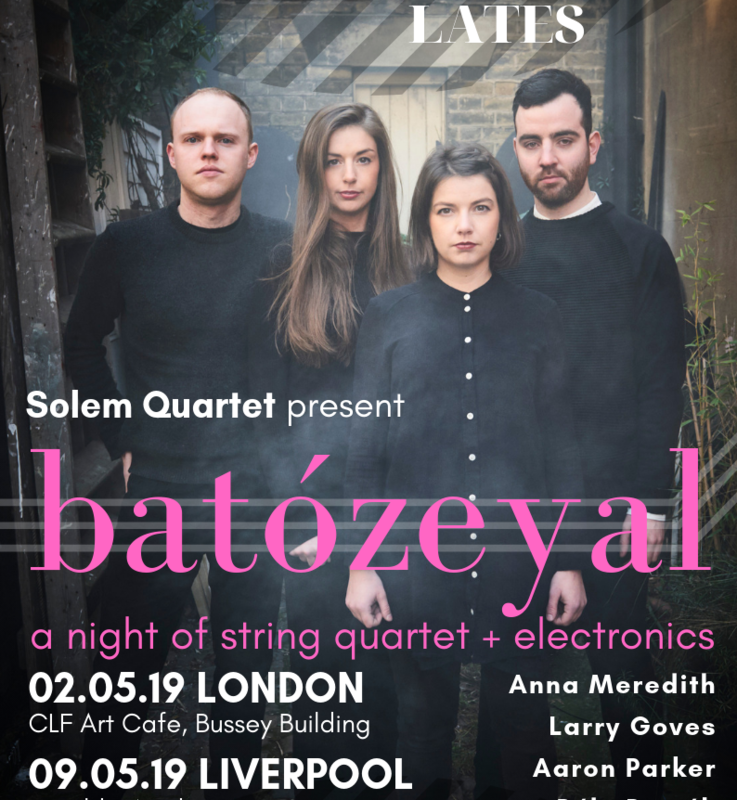 Our first set of concerts in this series will be batózeyal, a night of string quartet + electronics. We are excited to have commissioned two brand new works, from Larry Goves and Aaron Parker for this concert. These will sit alongside compelling contemporary works: Jonathan Dove’s ‘Quite Fast’ from his 2001 string quartet Out of Time; Paul Zaba’s Sidechains, a dizzying musical incarnation of the electronic effect of the same name; and Anna Meredith’s, Tuggemo, a dance-inspired romp mixing the sounds of live string quartet with synth electronics. 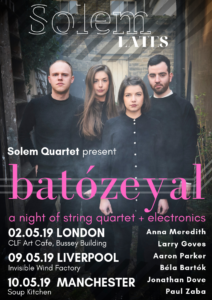 The title of the night, batózeyal, shares its name with Aaron Parker’s piece, which responds to and interacts with Bartók’s 3rd Quartet, also featured in this concert. In the context of the contemporary music which surrounds it, Bartók’s work sounds as fresh and visceral as it did at its conception, almost 100 years ago. You can see us performing Bartok’s 3rd Quartet here. CLF Art Cafe at the Bussey Building in Peckham will be the first venue to host this exciting event, on 2nd May with music starting at 8.30pm. In the following week we’ll be taking the show to the North West, with shows in Liverpool (Invisible Wind Factory) and Manchester (Soup Kitchen) on the 9th and 10th respectively. Please follow this facebook event link for more details. Or buy tickets directly for London, Liverpool and Manchester.